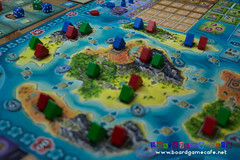 Following our highly enjoyable Paolo Mori night last week, we continued into this Friday by hosting Stefan Feld, who’s really on a streak of fire with a series of great games released in the past few years and THREE new games set for 2013. 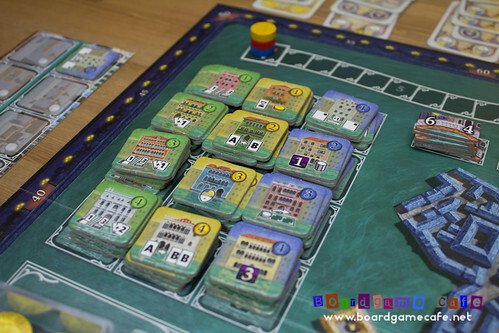 Find out how well Stefan Feld games play. Gamers: Enson, Victor, Ivan, Boon Khim, Rhyen, Kareem, Heng, Waiyan, CK Au & others. 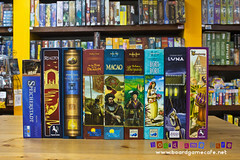 Games: 2005: Roma, 2007: In the Year of the Dragon, 2009: Macao, The Pillars of the Earth: Builders Duel, 2010: Luna, Speicherstadt, 2011: The Castles of Burgundy, Strasbourg, Trajan, 2013: Bora Bora, Rialto. 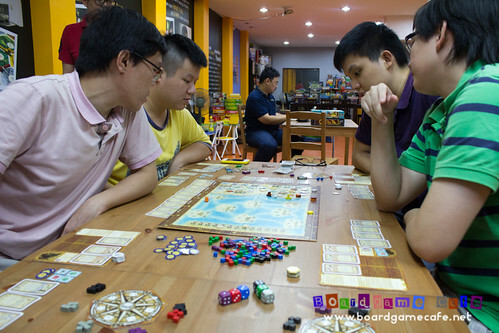 After last week’s enjoyable run of Paolo Mori games – VASCO DA GAMA and LIBERTALIA – we decided to continue with a theme night for our Friday meetups. 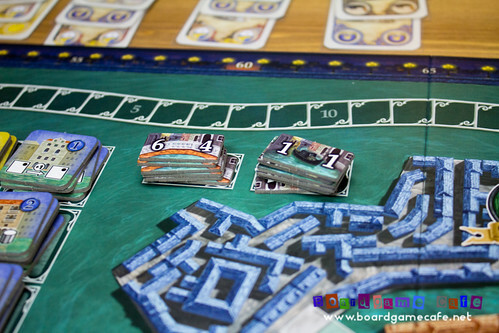 And who better than designer Stefan Feld for this Friday’s theme night! 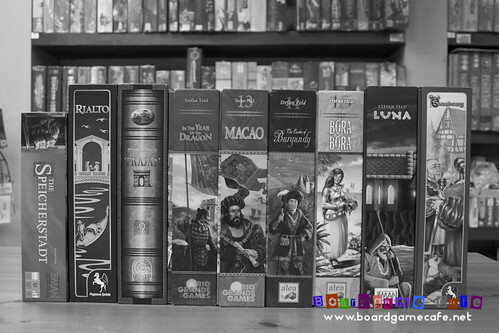 Am pretty sure if you have play boardgames in the past 6 months, you would have played one of Stefan’s games. Even I didn’t realize the breadth of his games until we started putting together his games from our collection for tonight’s gaming. Impressive! 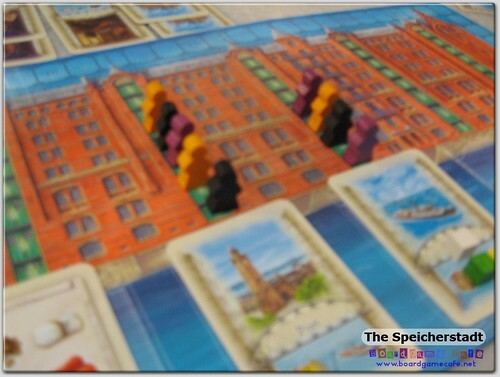 We put together a total of 9 games ranging from the light/fast to play ie SPEICHERSTADT, to the depressing IN THE YEAR OF THE DRAGON, agonizing bidding decisions in STRASBOURG and his latest for this year such as BORA BORA and RIALTO. 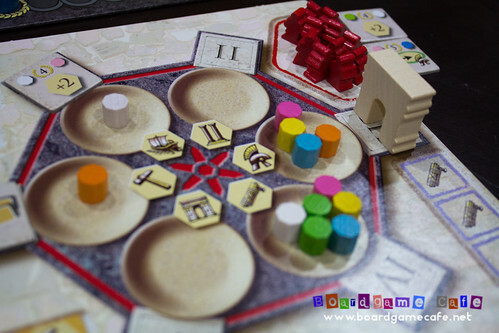 He even has one game in Masterprint edition – the congkak-ish TRAJAN. And surely we can’t miss the brain-blowing 13 possible actions of LUNA, best played at 3 am in the morning. tsk tsk. 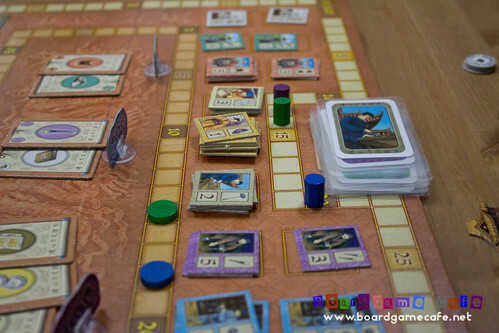 Footnote: Actually we missed out two of his earlier games which are also in our OTK games library – ROMA and THE PILLARS OF THE EARTH: BUILDERS DUEL; both 2-player games. 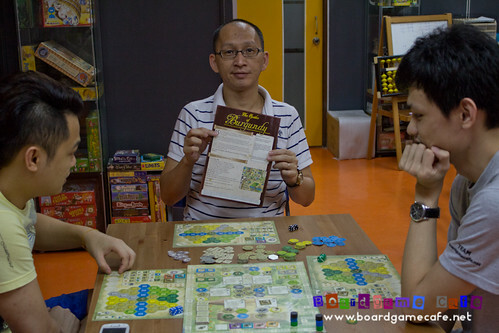 Interesting that we started with the first Stefan’s game that was played at OTK (back then, we played at Old Town Kopitiam). 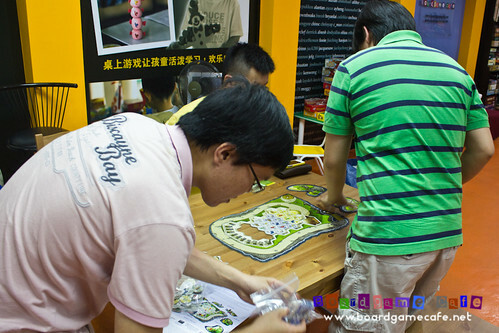 When I arrived at OTK, five gamers were already ready to start IN THE YEAR OF THE DRAGON. 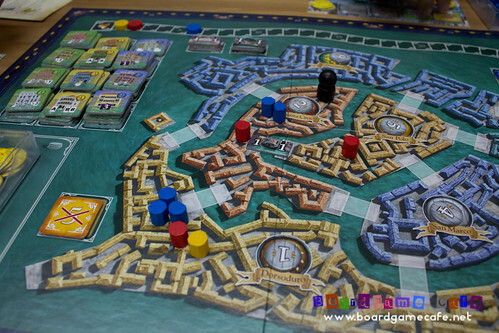 We first played this game back in 2008 when I got a copy from my Sydney trip, and we enjoyed the depressive nature of the game (where sacrifices are inevitable) that plays well under 90 min. Back then, Feld was still a relatively low profile game designer. Below: These are the subjects you (as Prince) will hire into your palace to help you in your quest for prosperity and prestige… but very often, after they’ve expended their usage and over-stay, you’ll send some for the ahem.. sacrifice. 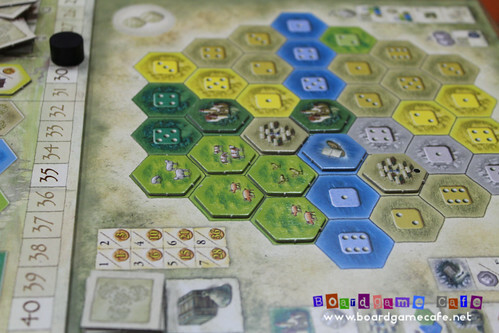 While the first table continued with their 5-player IN THE YEAR OF THE DRAGON, I decided to start another table of 3-player THE CASTLES OF BURGUNDY. 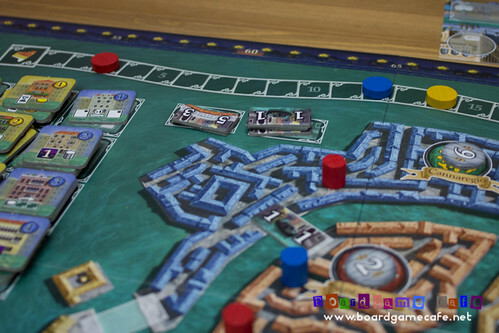 A highly rated game from 2011 and one of Feld’s finest. 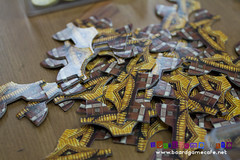 As with most of Feld’s game, the theme is pasted on – and yes this one has dice (Year of Dragon doesn’t). Lots of colorful tiles. And high number of possible combos. This game has been played a few times at OTK but this is the first time I’m sitting down for a session myself. 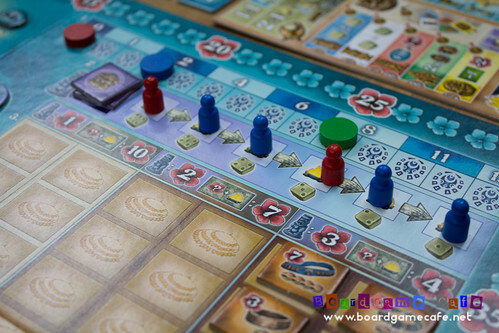 It plays much better than I’d expected – so that’s another plus for Feld’s recent games, most of which I rated high. There’s a lot of moving parts but our session moved along at a brisk pace. You could argue games like this encouraged AP (analysis paralysis) hence slowing down the game when you’ve more players involved but I subscribed to the school of thought that says AP is a problem of the player rather than the game. The three who’s in this session – Victor, Enson and myself – tend not to dwell on every single point and half-point we can gain or lose and I felt our session lasted no longer than 90 min (if you exclude the teaching time). That’s very good return for a game that provides that level of thinking and competitiveness. And this is one of the defining characteristic of Feld’s game – relatively short game time, yet provides enough punch for your brain. The game’s said to be best for 3-player. Everyone keeps telling me it’s not good for 4 but from my session, I would think four should play as fast unless of course if you have a serial AP gamer! I won’t go indepth into a review/thoughts of this game for this sessrep. Hope to do another session soon and use that to do a more fuller sessrep coverage. 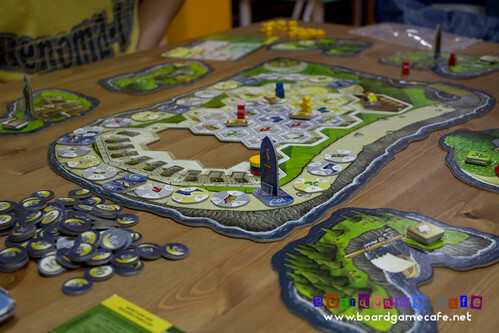 The other table (In the Year of the Dragon) has finished their game… let’s see what’s the next Feld games to hit the tables. Boon Khim arrived just as the YEAR DRAGON table finished their session. 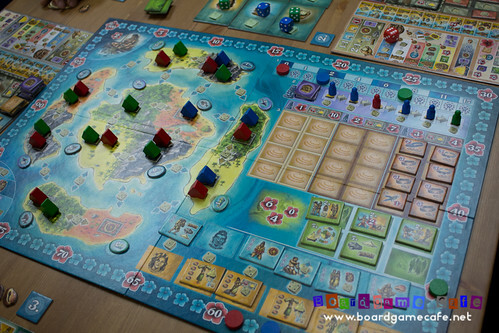 With 6 players, they now split into two tables to do BORA BORA (this table) and LUNA (the other). 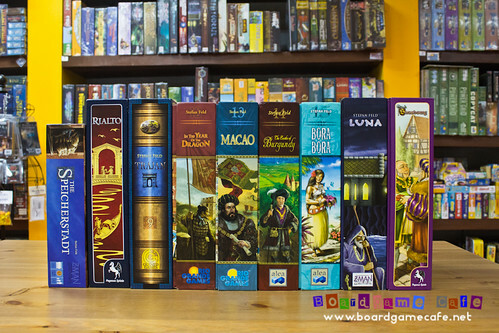 Three tables of Feld games in session now at OTK! 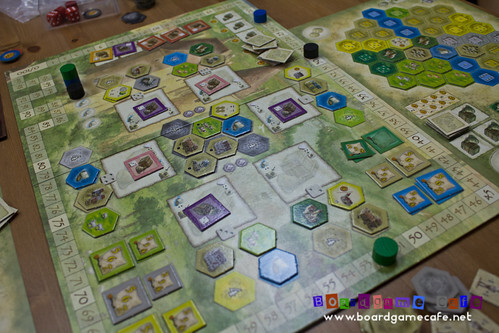 My table of CASTLES OF BURGUNDY… towards the late stage of the game. 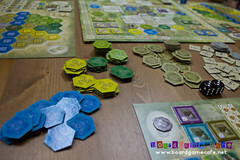 BORA BORA has lots of moving parts too.. And if you like Castles of Burgundy, you would like this (and vice versa). 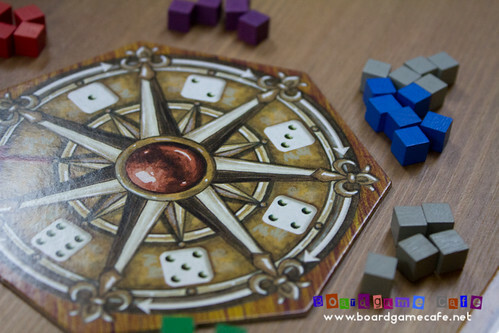 Impressive looking game board – another common thread in Feld’s newer design. Dice. Luv them or hate them. Feld seems to love them. Incidentally was discussing this with ayheng on how Feld likes to include dice in most of his games. 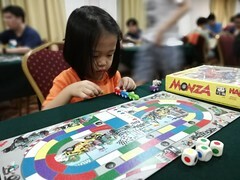 While the dice affect the game, they are not overpowering the game into a dice fest. 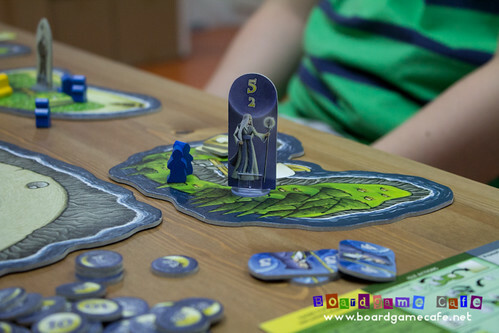 Unlike the newer Feld games, LUNA has less game components.. But then this game has like 13 possible actions!! What it gave up in number of components, it returned in number of actions… LOL. I go with Kareem’s thought that once (and if) you get passed the mind block, there’s a good game in this. IN THE YEAR OF THE DRAGON (2007)… again! 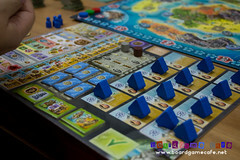 When our table finished Castles of Burgundy, the two tables were already engrossed in their respective Feld games – BORA BORA and LUNA. 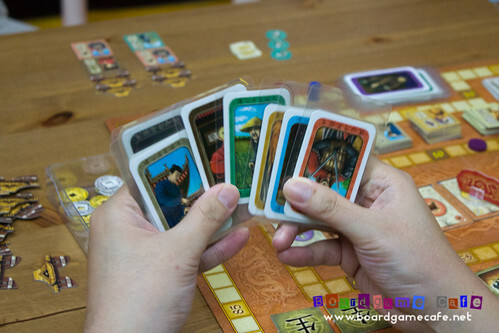 So the three of us deliberated on which Feld games to pick next… choice was between MACAO and YEAR OF DRAGON. The Dragon got the pick! 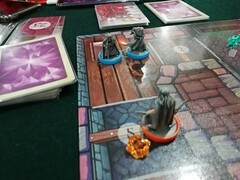 Year of the Dragon is a very unforgiving game. The 12 events are open info and you do NEED to make your game plan to align with the 12 events, and not on a turn by turn basis. 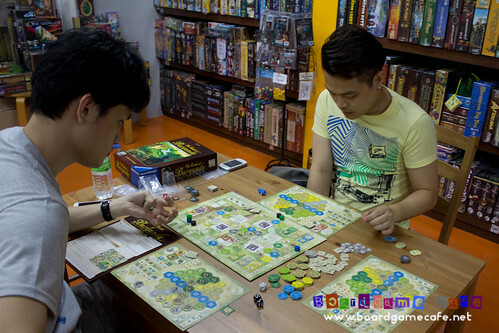 This is one of the few Feld games that allows for more strategic rather than tactical plays. If you timed your plan out of sync with the 12 events, you just might find yourself struggling to cover the gaps that kept popping into your game plan. 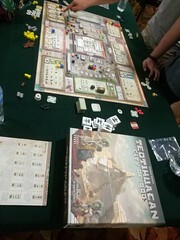 Here above, the player was a turn or two behind the events, so he kept “losing” subjects/workers as he could not build the palaces swiftly enough in lieu of the other pressing actions he needs to take. It’s bad karma to sacrifice your loyal subjects. Hoho. 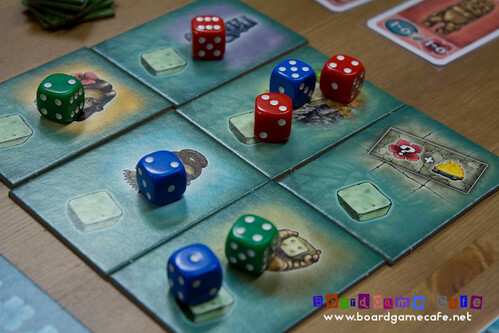 Our first Stefan Feld games back in 2008.. And still one of our favourites! 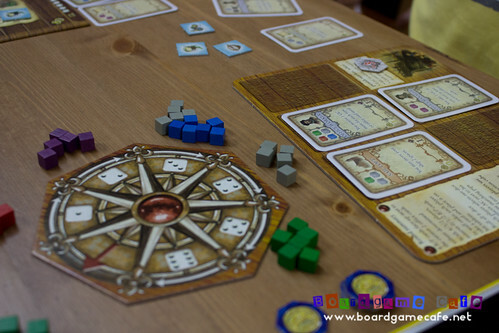 Next up in R2, we grouped into two tables to do RIALTO and MACAO (next table). 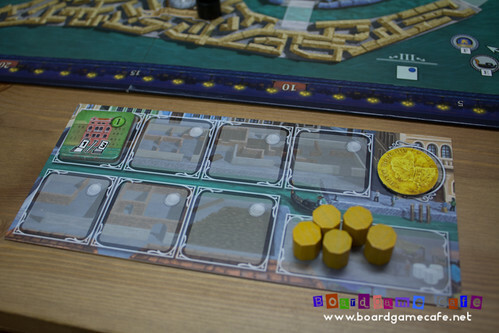 RIALTO is the most recent Feld games and thanks to Kareem, we have an early copy to testdrive last Friday. I was not in that session but heard good comments from those who played. 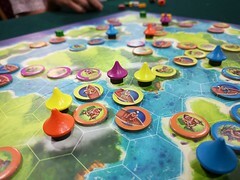 Just six turns – bid for actions, do your actions (and building) then decide how many people you want to drop into the active region for area control ala El Grande. That’s it! 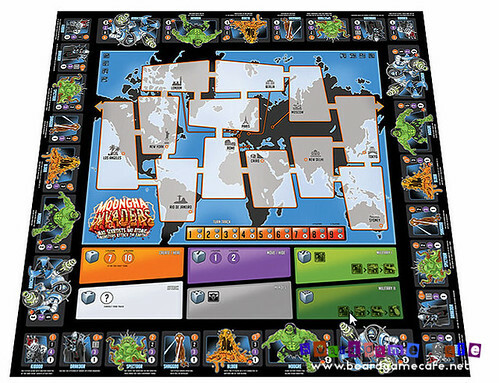 The player board where you placed the Buildings acquired. Buildings are free and you acquire them based on the building tech level you’ve bid (not unlike Endeavor). The abilities of the buildings give you the combos you hope to set up to win you the game. 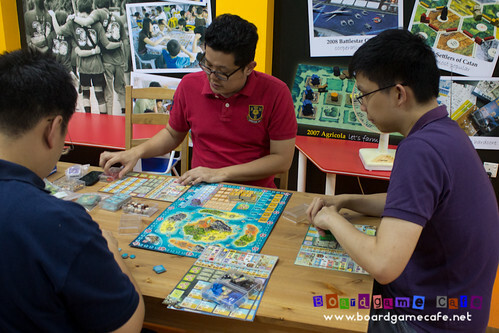 I was playing with sharks in this game – both Kareem and Rhyen had played this last week – so when these two said they believe getting the right building combo wins you the game, you better listen! Bridges and gondolas. Ignore both at your peril. 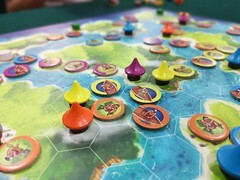 Blue (rhyen) already dominated Region 1 – and unlike El Grande, there’ s no (or not many) option to land more people into Region 1 to retake control once it’s past. 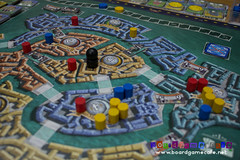 The gondola (above) does allow you to drop one additional person into an adjacent region of your choice but it’s usually not a very effective way to regain control. The Doge track (for initiative) – see track at top of pic below – is not dodgy at all and is quite important as it break ties. 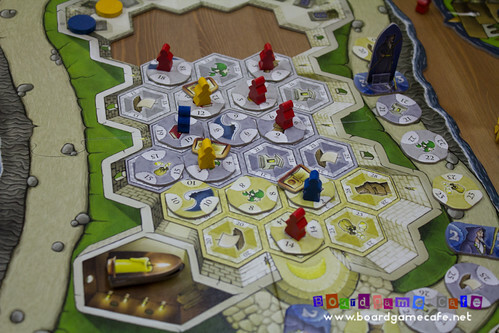 Can’t wait to see how BRUGES (the last of Feld’s games for this year) play! This is turning into a very good Feldian year! 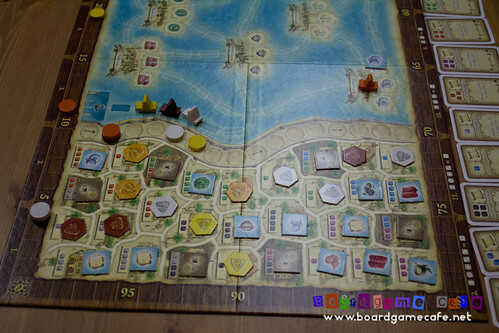 While we were busy with RIALTO on our table, the other table picked up MACAO, Feld’s 2009 design. 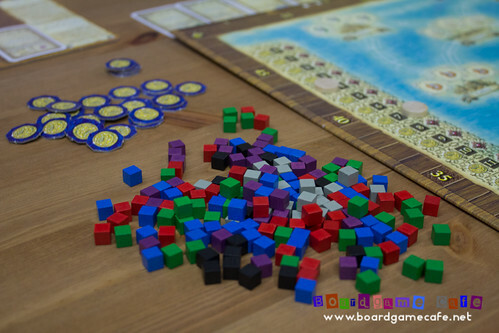 MACAO is a game about accumulating (the right color) action cubes which you use to activate the action cards in your tableau… with a twist. Your action cubes come to you via this windrose (below). And believe me, it’ll take some time for you to adjust to the timing of this windrose. It’s one of Feld’s unique design.. and it works! 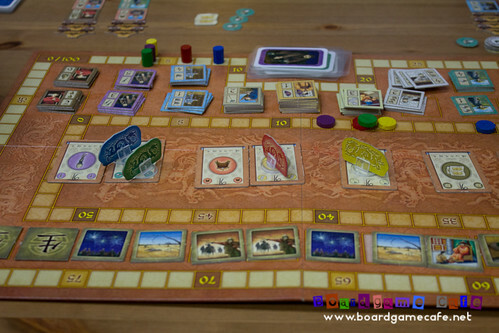 MACAO plays four (most of Feld’s games play four, some five) and MACAO is one of the earlier Feld games that runs over 12 turns (like Year of the Dragon) unlike his newer games which runs in a brisk 5-6 turns. 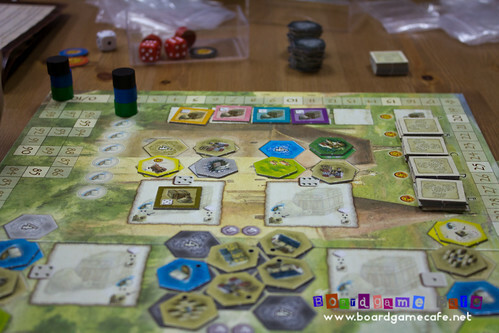 Stefan Feld’s certainly on the roll in the past couple of years.. 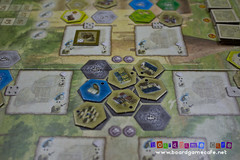 He had 3 strong games released in past couple of years – Castles of Burgundy, Strasbourg and Trajan. 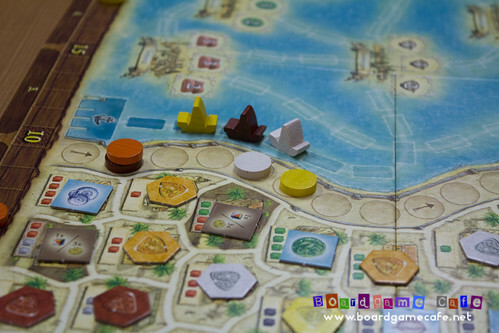 And this year, he’s going to have another three games out by (or before) Essen and we’ve played – and rate highly – two of them – BORA BORA and RIALTO. What gives BRUGES, his third for 2013? So what didn’t hit the tables last night? SPEICHERSTADT, STRASBOURG and TRAJAN. 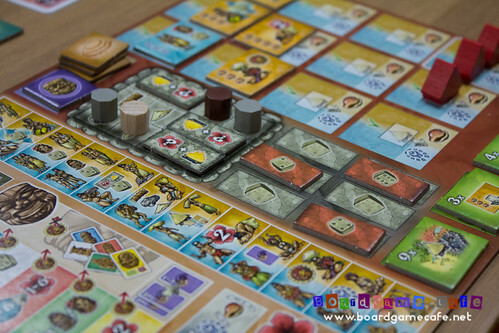 And obviously ROMA and BUILDERS DUEL – which we forgot! – but these are 2-player games. 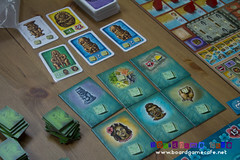 Here are some pics of these “missing” Feld games from our previous sessions. Above: Agonizing nah-take-that bidding in SPEICHERSTADT. BGC SESSREP PROMO 20% OFF! If you have always wanted to add more Stefan Feld games into your collection, now’s the best time to do so! 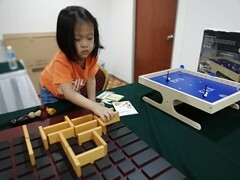 As part of this sessrep, we are running our weekly BGC SessRep Promo where you’ll get 20% discount (from our retail price) for games played in this Friday’s OTK session. Offer lasts until next Friday! 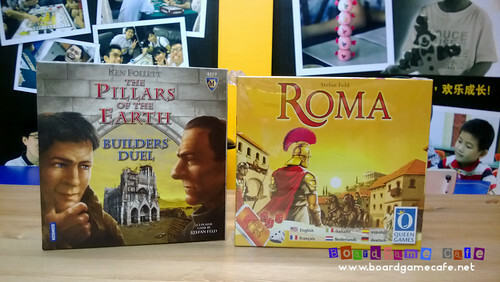 FYI the following games are OOP (Pillars of the Earth Builders Duel) and not yet in stock (Trajan, Bora Bora, Rialto). 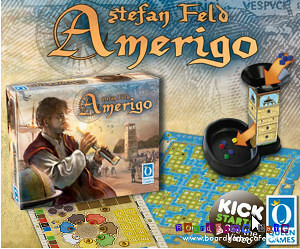 If you are a Stefan Feld collector, you surely would have picked up his latest Kickstarter on AMERIGO? Will be interesting to see how Feld implements the cube tower mechanic that’s used by Wallace in his Wallenstein and later Shogun. 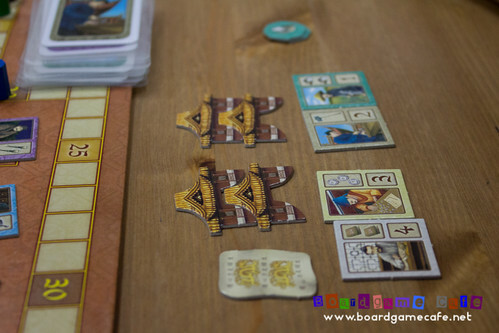 I guess after the enjoyable Paolo Mori meetup two weeks back (read sessrep here), it was another successful run this Friday with a Stefan Feld meetup. 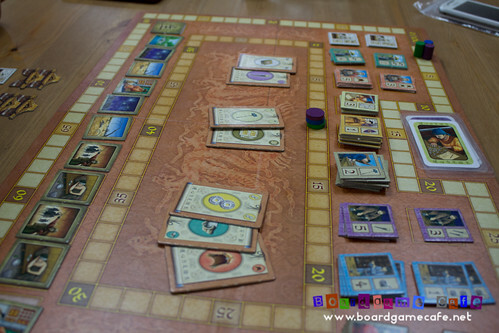 The richness of Stefan’s games made for a very enjoyable night for everyone ending only at 4:30 am, and I think most would welcome another Feld session. 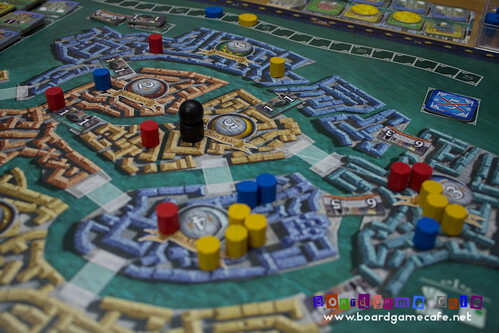 And we switch off the lights to Stefan Feld games….. for now. 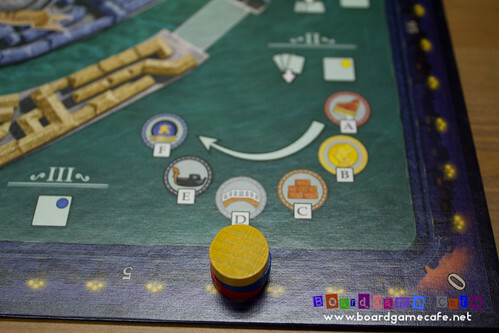 Someone’s asking for TOLEDO to get some playtime… so that means.. a Martin Wallace theme night? 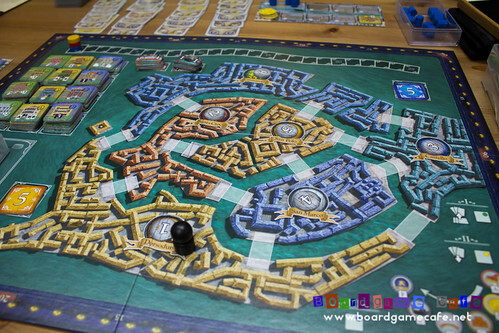 Oooh… a Martin Wallace game nite would mean we’ll see Age of Steam, Brass, Railroad Tycoon, Automobile, Liberte, Rise & Struggle of Empires, Tinner’s Trail, After the Flood, God’s Playground, First & Last Train to Nuremberg & Wensleydale, A Few Acres of Snow, Discworld, Aeroplanes and one of his most recent P.I. 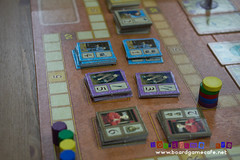 And if his latest Moongha Invaders kickstarter is ready and shipped, that’ll be the highlight of our Wallace game night! You must not miss it! Next week: ARTIPIA Game Night? Let’s not get carried away first…. what shall we do next week? 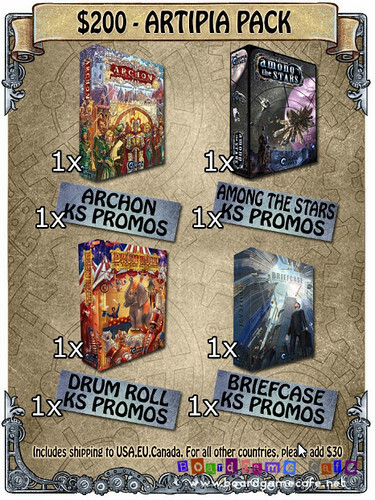 Given ARCHON, the latest game from Artipia has just concluded it’s Kickstarter project successfully – and unlocked all manners of bonus & promos for its backers! – we can do an ARTIPIA night of Drum Roll, Among the Stars and Briefcase. Dun miss that invite! 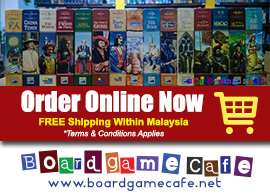 To view a listing of all games in stock, please visit our (blog) Webstore Listing page. Wallenstein is a Dirk Henn design.